We have struggled to get our 3 month old to sleep in his crib because he loves his swing so much. He loves to lay under his mobile (the one that I purchased to match his crib bedding) but you have to crank it every 30 seconds which gets really annoying. I wanted to try this mobile because 1) it was battery operated, 2) it had a dimming feature that would dim the music to get the baby to wind down and drift off to sleep. This mobile has worked perfectly and our son has slept in his crib ever since we hooked it up. The music is also nice as opposed to some other mobiles on the market. 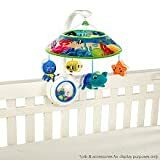 This mobile is worth every penny we spent on it just based on getting our son into his crib instead of sleeping in his swing. The low battery indicator is really nice to have because there are no surprises at nap time with the batteries being dead. As for getting it attached to the crib, we have a convertible crib and the strap that goes around the frame works great as long as you pull the strap tight enough. The first time we put it on it wiggled a little lose but my husband pulled it tight and it doesn’t move anymore. Our crib has a very wide flat ledge which was hard to fit other mobiles on. As for the comment about clicking, I noticed that it clicked the first time (when it was leaning over), once we got it snug and upright the clicking stopped. The piece that turns the mobile was having a hard time turning because the mobile was not level. Easy to install I thought, and my 10-week old boy was immediately captivated by the spinning fish. The music selections are fantastic, and I like the way the mobile looks. After our baby was moved to an open crib in the NICU we were able to get her a mobile. My husband, being a musician, was very pleased with the music. It as songs you don’t normally hear and was enjoyable for us as well as our baby. As soon as we turned it on she was out. She actually gets upset if we turn it off while she is trying to sleep. I’m very pleased with our choice and it fits well on the cribs.